For the couple in love with a traditional taste; this two-post alter backdrop is the perfect setting to say your vows. You show up with your romance, love and 10 guests and we will provide the setting, flowers and decor. 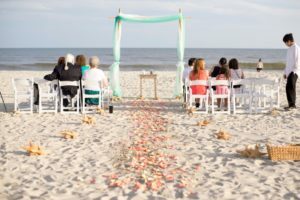 The music provided will add to the ambiance for you and your guests with this fantastic Myrtle Beach wedding package. The unity sand ceremony will add a special touch you will remember for years to come. Relax and enjoy your day at the beach; our professional wedding photographer will be capturing every moment for you! Choose your wedding package below and go to checkout. No payment or credit card is required at this time but your ceremony date & time can not be confirmed by our associates until your deposit is paid.